What’s the highest margin item for many retailers and restaurant chains? Answer: the unredeemed gift card. While the vast majority of gift cards are eventually cashed in, there is a percentage of cards that will never be used. These unredeemed gift cards can generate near 100% profit margins for retailers. Even when the cards are redeemed, the retailers benefit from collecting the cash upfront. It’s like putting a Cheesecake Factory dinner on layaway. After a certain period of time, normally about 2 years, companies are allowed to book the profits from unredeemed gift cards as “Breakage Income” in their financial statements. Here at The New Madisonian, we decided to investigate which retailers benefited the most from unredeemed gift cards. As it turns out, most retailers and restaurant chains don’t book enough “Breakage Income” to be required to disclose it in their financial statements. This was the case with big retailers such as Wal-Mart, Amazon, and Target, as well as some major restaurant chains such as Darden (parent company of Olive Garden and Longhorn Steakhouse.) However, there were several companies we examined that booked significant Breakage Income. 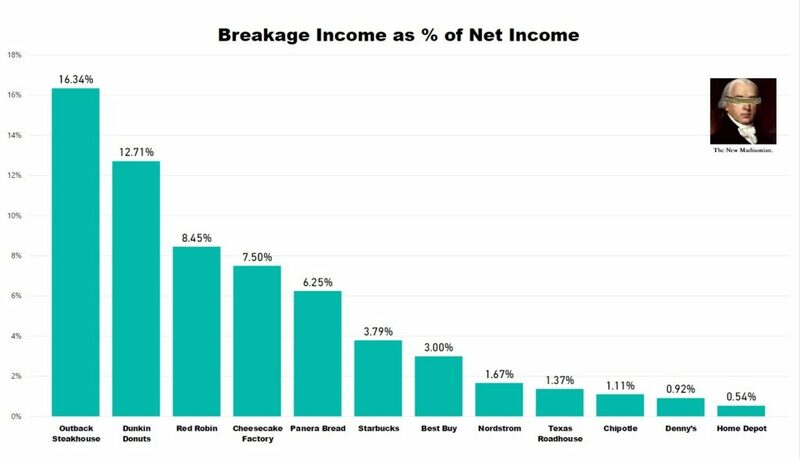 First, let’s take a look at which companies booked the most breakage income in total. Starbucks leads the pack with $105 million, with Best Buy ($37MM), Home Depot ($34MM), Outback Steakhouse ($26), and Dunkin’ Brands ($22) rounding out the top five for the companies we were able to examine. Of course, what’s more insightful is to examine breakage income as a percentage of total income, which we do in the chart below. We measured this by taking breakage income from the most recent fiscal year and comparing it to Net Income 2 years prior. The reason for this is that the actual cash flows would’ve likely come about 2-3 years earlier, so we believe this is a better way to examine breakage. 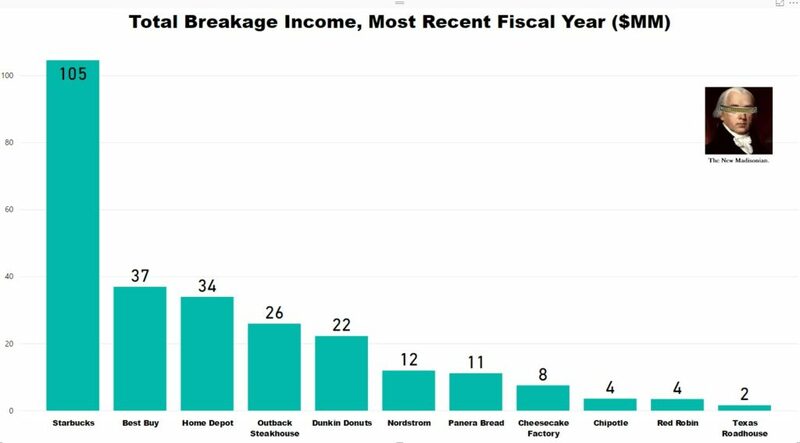 When measured breakage as a percentage of Net Income, Outback Steakhouse leads the pack with over 16% of its income coming from unredeemed gift cards. It’s important to note, however, that since profits can fluctuate, this doesn’t automatically mean that Outback is the biggest beneficiary; merely the largest by this particular metric during this particular timeframe. 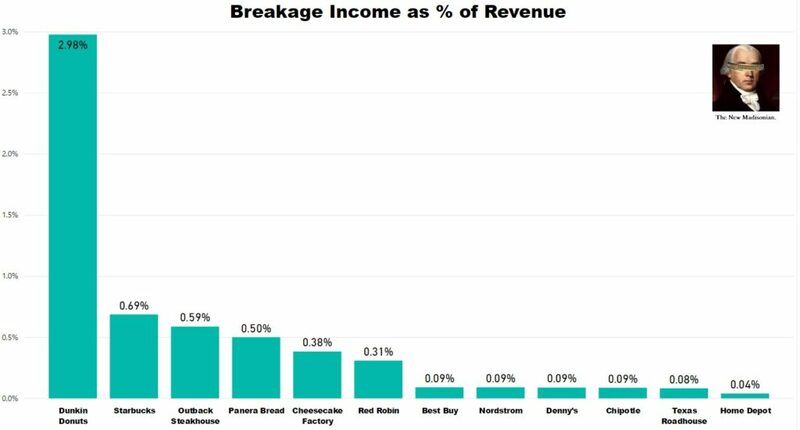 While analyzing breakage as a percentage of Net Income makes the most sense, we decided to also look at breakage income as a percentage of revenue. On this metric, Dunkin Donuts had the highest percentage by far, but this is also likely a result of their business model, as Dunkin Donuts is nearly 100% franchised. Behind Dunkin, we find Starbucks, Outback, and Panera Bread being the next biggest beneficiaries. If there’s a lesson here for companies, it’s probably that they should be selling as many gift cards as possible. There are virtually no downsides and in a select percentage of cases, they’ll achieve the glory of near 100% profit margins! 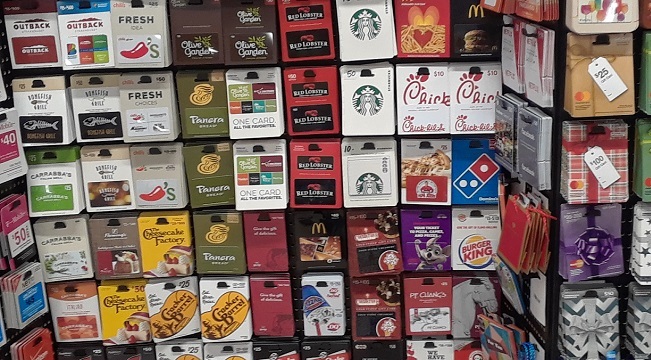 As a consumer, the lesson might be that if you’re going to buy gift cards for someone, you should probably go “broad” unless you know their specific tastes. An Amazon or Walmart giftcard is better than an unused Cheesecake Factory or Dunkin’ Donuts gift card.